~ Youngstown Cupcakes, Cakes, and All Things Yummy! 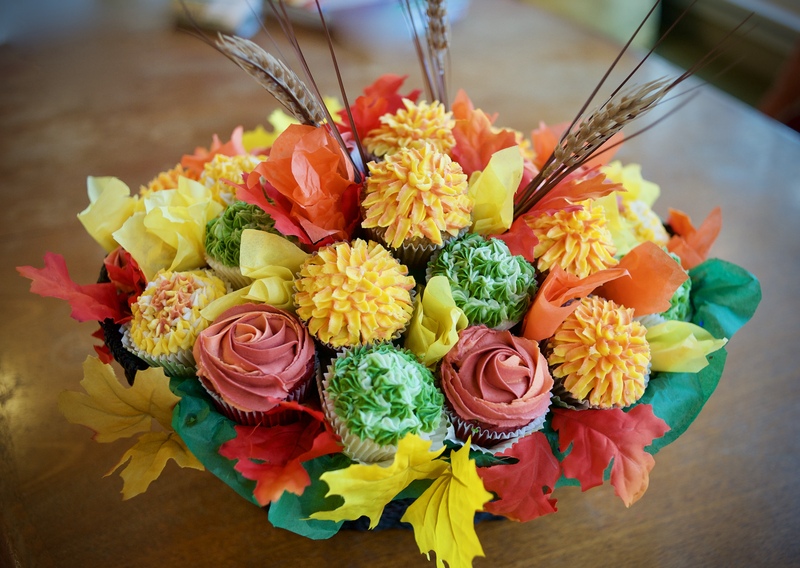 I made this fall flower cupcake bouquet as a special gift for a friend to take to her grandmother’s 80th birthday. I loved working with these fall colors. The cupcakes were an assortment of chocolate, vanilla, and red velvet flavors, all with vanilla buttercream. I variegated the icing colors in the piping bags to make the flowers look more realistic and used 3 different Wilton piping tips to pipe the petals: #18 for the green hydrangeas; 1M for the red roses; and #81 for the yellow mums. Once the cupcakes were piped, I popped them into the fridge for a bit to firm up. I used wooden skewers and foam blocks to arrange them in the basket, then added green and orange tissue, silk leaves, and a few fronds to add height and interest (I made sure nothing “foreign” touched the icing…:0). Hope you had a great 80th birthday, Louise’s grandma! I really enjoyed making your cupcake arrangement! Another sports cake for a great kid! I’ve made birthday cakes for this sweet boy for many years now. They’re always sports-themed and just keep getting bigger and more fun! Anthony’s mom asked for a 2-tiered vintage baseball-themed cake with a worn, vintage look. The only way to really do that without an airbrush (which I don’t own….yet) was to cover it in fondant and creatively brush on the “dirt” using cocoa powder and a small brush (cocoa powder…who knew? worked great!). The base 9″ tier is a 2-layer chocolate cake with mocha filling and the 6″ tier is Italian cream cake with almond buttercream filling. The cakes are iced with vanilla buttercream and then covered with homemade marshmallow fondant. The details are a combo of fondant, red edible pen (small stitching on baseball), and cocoa powder. Happy 14th birthday, Anthony! Keep being a great kid! As much as I enjoy creating themed cakes for kids (and big kids, too :0), I find myself more and more yearning for the design freedom allowed when doing a special occasion cake for an adult…. Without the constraints of a picture or character to box in the design, it’s fun to imagine what I’d want in a special birthday cake for myself and then just go for it. With 4 layers, there’s a lot more filling going on in there…which is always a good thing, right?! Once I smooth-iced the cake with with more (yummy!) vanilla SMBC, I encrusted the outside with slivered almonds to give that irresistible crunch to every bite. Then I added dollops of creamy buttercream to the top along with fresh raspberries and some more slivered almonds. I decided it needed some “bling” to really say “HAPPY BIRTHDAY!”… because even the adults in our lives deserve a special touch (or 2 or 3) on their birthdays. I made a fondant plaque and covered it with gold edible dust…I was going for an antique-y look, which really came through with the cracked fondant (not entirely planned, but I loved the effect once I brushed it with gold dust). Then I added a few suspended stars for fun! Hope you had a TERRIFIC birthday, Gina…this one was a real inspiration!! Post-Holiday Purple Birthday Cake and Cookies for Maddie! I made this cake for a young girl who’s birthday falls right after the holidays…must be hard to make a color statement with all that red and green. So this adorable 14-yr-old asked for her birthday cake to be purple. That’s it. Purple. And chocolate. Surprisingly easy to please for a teenager, huh?! The cake is a 9″ chocolate mocha cake with chocolate mousse filling and iced with vanilla-bean buttercream.The pics turned out more pink-looking, but the icing color was a mix of Americolor royal purple and electric purple. I added the green and blue sequin/sprinkle mix to add some contrast. The name plaque, number, and stars are all made from homemade marshmallow fondant. Hope you had a great birthday, Maddie! I really enjoyed making your purple cake and cookies! I did a bunch of baby shower cakes last year and I’m so behind on posting, I’m only now getting to them. I also had orders for lots and lots of nautical or ocean-themed cakes. Not sure if there were enough to qualify as a “trend,” but it seemed like a wave of them during the summer and fall months (no pun intended :0). The mom-to-be knew just what she wanted in terms of style, I just added a few tweaks of my own. For the cake, the bottom tier is a 9″ round chocolate and the top is a 6″ round vanilla. Both are filled and iced with vanilla-bean buttercream The decorations and boat are made from homemade marshmallow fondant (except the red, I buy that because it is so hard to make large quantities). The little sail boat is made from brown fondant with lots of tylose powder (to make it stiff); I used a woodgrain stamp on the sides to make the fondant look like wood. The biggest trick was letting the sails dry long enough to stand up and stick to the skewer, which goes down into the top tier to hold the boat in place and keep everything together. The baby boy was fun to make….There’s actually a cute little body under the blanket (wish I would have taken a picture). I wanted the details on his little face to be subtle and soft, so I pressed them into the pliable fondant with a needle tool and added a little dot of flesh-colored fondant for a nose. I drew his hair on with an edible marker…so cute. The anchor and lifebuoys (that’s really what they’re called) are cut using cutters and the roping is 2 strands of fondant twisted together. The bottom tier is iced with a rough surface to look like the water using a dark to light ombre technique. The top tier is similar, just more smooth-iced. This was a fun cake for an excited mom-to-be. It was back in November, so I’m sure she’s a happy (and exhausted) mom by now. Congrats, Maria! New cake ideas for 2019... Bunting Toppers and Drip Cakes! Life is crazy and I love to bake. I'm a wife, mother of 3 nutty kids, and an admitted sugar-holic. Ten years ago I left my job as a senior consulting engineer in Salt Lake City, UT, to get out of the rat race and raise kids. We up and moved to a quiet, small town in NE Ohio to be near family and bought a 180-yr-old historic home, always a dream of mine. Along the way, I discovered my joy of baking, which allows both my engineering side and my oft-suppressed creative side to emerge. It began with the desire to bake birthday cakes for my kids (I hated to buy them) and has blossomed into a cupcake-baking business for a local bakery. Over the years, many people have asked if I take orders. So, here they are. Check out the site, we'll be adding new cupcake flavors weekly as well as the occasional cake. And in case you're wondering about the name, it's an homage to the big, old gray barn in my back yard. What a bonus, it came with the house! Put on a smile and BAKE! New cake ideas for 2019… Bunting Toppers and Drip Cakes!